December is a busy month and it is also a month of reflection as we prepare for a new year. As we’ve worked this year with educators across Canada and internationally, we’ve been heartened by the powerful conversations in support of ensuring assessment, evaluation, and reporting is in the service of learning. These changes require that we thoughtfully build plans to support the learning of our teachers, administrators, Trustees, and senior leaders. A mindful plan also includes involving parents in the conversation. Bridging home to school and school to home is an important pursuit. In our work with school systems, we are often asked to meet with parents. For us, this work can occur after we have had the opportunity to better understand the context in which students learn and educators teach, including reading board reports, viewing information on the district website, working with teachers and division support staff, and meeting with school leadership teams. The point at which we are asked to engage in parent information meetings or district parent sessions is often when the structure that reports student learning begins to shift. Across this country, jurisdictions are changing report cards and reporting mechanisms to reflect today’s challenging curriculum and communication landscape. The reality of this work often results in mixed reviews from parents and the broader community. 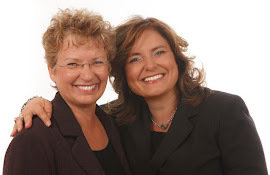 And no wonder – the perfect report card or reporting process just does not exist. The complexity of the curriculum, the diversity of learners and communities in which they live, and the inherent errors that occur when we communicate using a coding system and the written word can seem overwhelming. What we can do, however, to mitigate these issues is to involve students in communicating evidence of their learning, to ensure that teachers’ professional judgment is informed and guided by district policy, and to build trust over the long-term. This often requires that we seek to understand before being understood – that age-old adage serves us well. As we plan for meeting with parents, we reflect on the large number of sessions that we have facilitated over the years. We strive to be respectful of the experience, intelligence, and commitment that each parent brings to the conversation. And at the same time, we wish to acknowledge the expertise and ‘craft’ knowledge that educators hold as they work in support of student learning. For us, there are five essential points around which we build the conversation with parents. Each one pulls parents and community members from their past experience as a student in school to the reality of pedagogy and politics today. It used to be that teachers chose what they were going to teach.We show parents what curriculum looks like today – its specificity and breadth. As we open curricular documents up to parents, we convey the depth of these documents and how it both directs and supports teachers’ teaching and students’ learning. No longer do educators choose a topic because it only interests them. 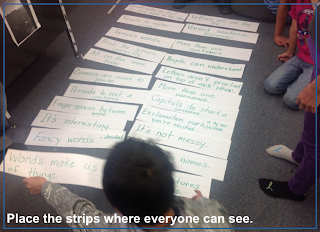 Today, a unit or a theme must unfold in support of the learning expectations or outcomes. 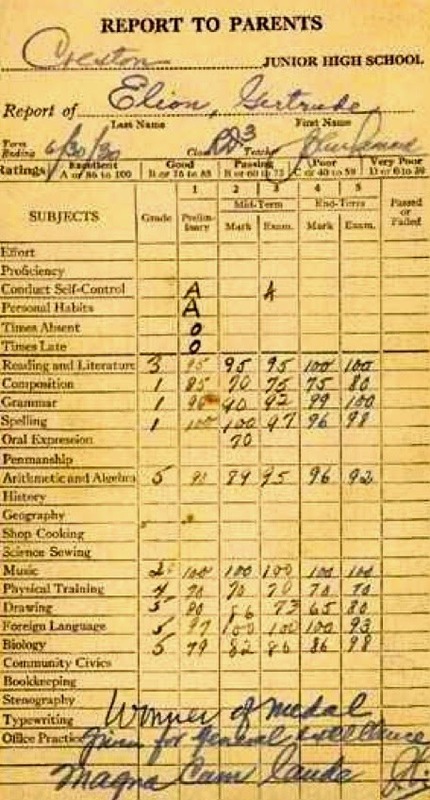 It used to be that test scores and results from quizzes and exams were sufficient evidence of learning. The complexity of today’s curriculum requires that students provide evidence of their learning in ways that go beyond tests, quizzes, and exams. For example, we cannot determine whether a student engages in a scientific investigation safely by giving them a test. We need to watch them in action. 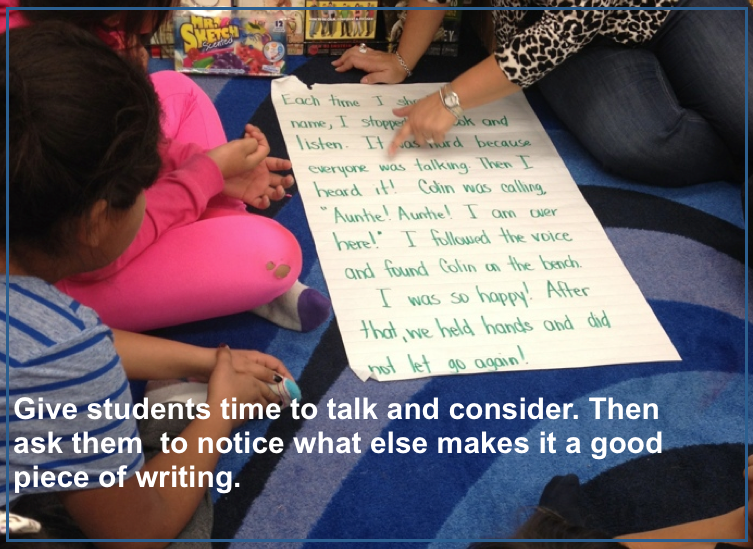 Nor can we determine whether a student can engage in classroom discussion by having them write a paragraph about it. We listen to them talk through issues and questions. 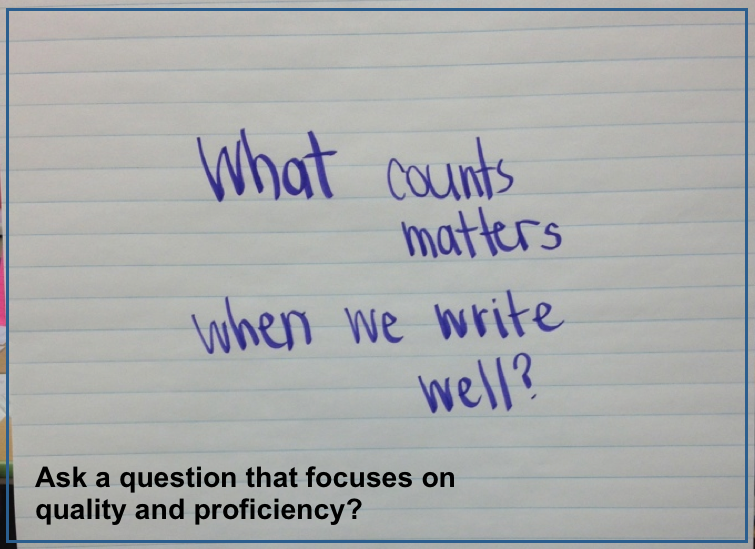 If a term or course mark is comprised of marks gathered from tests, quizzes, and a final exam, then we know that the breadth of the curriculum has not been addressed….only a part of it has. It used to be that all students had to show what they had learned in the same way and at the same time. In the past, if our students were studying the water cycle, for example, then all students had to write a paragraph about that scientific concept. The curriculum states that students should be able to describe the water cycle. Period. It does not dictate a singular way in which students should show what they know about this scientific concept. So today, students might write about it, they might put together a narrated video, or they might even make it rain by bringing in a kettle, a pie plate, and some ice as they demonstrate the water cycle. This does not mean that writing or putting things down on paper is not important. In fact it is. Many curricula speak to the importance of the written word; however, a student who deeply understands how she solved a trigonometric equation should not be penalized if she cannot tell how she arrived at the answer in perfectly formed sentences. The best way of explaining her thinking and making her mathematical problem solving visible to others might be to record herself going through the question, step by detailed step. It used to be that external examinations were the most important source of assessment evidence. Provincial or jurisdictional examinations do provide important and essential information. But because they cannot evaluate the breadth of the curricular outcomes or expectations, they are not the only measures upon which we can rely. We look to our teachers and their understanding of the curricula that they teach, of the ways in which students learn, and of what proficiency and quality look like. Teachers bring these three factors to bear as they pull evidence from multiple sources to make a professional judgement that informs the final evaluation or mark on the report card. What teachers do in classrooms with students matters a great deal. And their consideration of all that they know is important in giving the most accurate and up-to-date picture of how a student is doing compared to how they should be doing. Recently I read a piece by Bennett (2011) questioning the true impact of formative assessment. And, while I appreciate the powerful questions he asked, there are also some significant, unstated assumptions. One of those assumptions is that there is a lack of observational evidence to inform the work of teachers and others. And, that this lack undermines the process of formative assessment. While I can't speak to his experiences, I can speak to my experience in this regard. In my work over the past 30 years, formative assessment is considered within the larger context of classroom assessment (Davies, 2000, 2011). In Canada, for example, many policy documents have taken the stance that classroom assessment – which includes both formative and summative assessment – is actually a research undertaking. That is, classroom teachers need to triangulate their data much the way social scientists do (see, for example, Lincoln and Guba, 1984). In practical terms this means teachers need to collect the products students create, observe them as they engage in the processes to be learned, and have conversations with them (through words spoken, written, or recorded) to better understand the meaning students are making as they learn. 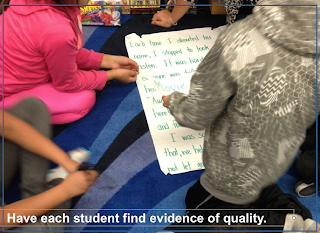 As students learn, teachers collect evidence from multiple sources over time to inform their professional judgement regarding student learning. As teachers deliberately plan to collect evidence in relation to what the curriculum states what students need to know, understand, do, and articulate, they increase the validity of their professional judgements. As teachers engage in ongoing professional learning, they come to better understand the quality expectations for students, given their age range and the subject area discipline. Powerful professional learning goes way beyond scoring of common assessments and includes moderation of collections of evidence of student learning - a process shown to increase the reliability and validity of teacher judgement (ARG, 2006). Further, as teachers deliberately collect evidence over time in relation to curriculum outcomes, they increase the reliability of their professional judgement. They have 'proof of learning' from multiple sources over time. The 'trustworthiness' of their findings is increased (Davies et al., In press). In this context, when teachers use an ongoing collection of evidence of student learning to inform their next teaching steps, the evidence of learning informs them. It ensures they are able to engage in 'informed assessment' and use that assessment information to inform their teaching and student learning. This is the true meaning of formative assessment. 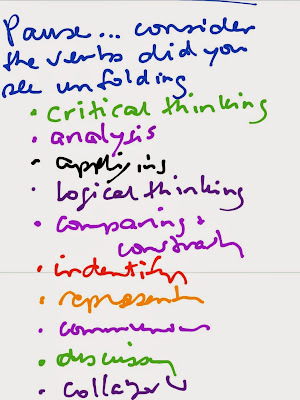 And, as teachers involve students in the assessment process they engage in formative assessment for themselves - a process often referred to as Assessment for Learning. 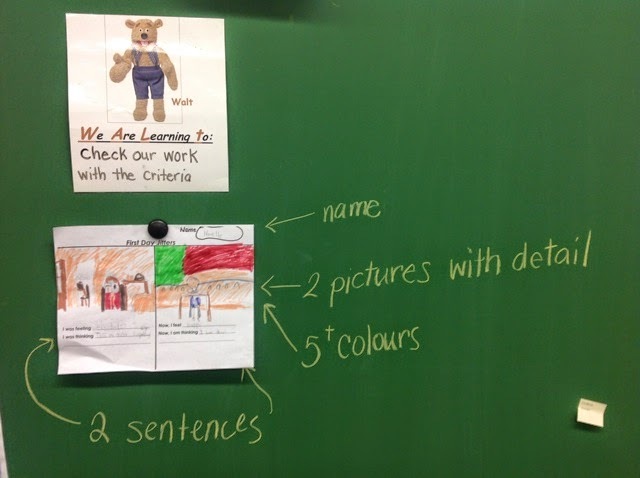 This photograph was shared with me recently by a teacher working with 7-year-olds in British Columbia. 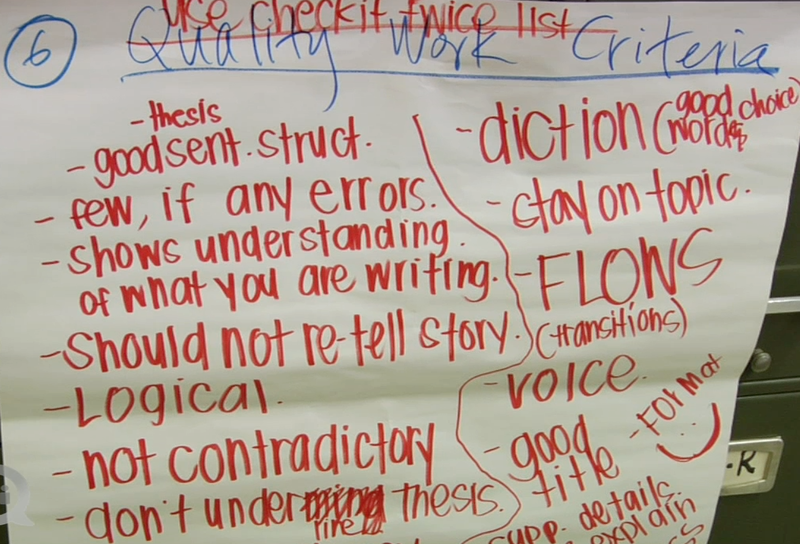 Notice how she is teaching students to understand quality and giving them the information they need to engage in formative assessment for themselves. Bennett (2011) is right when he notes that educators and others can often be found reducing formative assessment to "five simple ideas" or the "eight great strategies." It is fair that this over-simplification invite criticism. 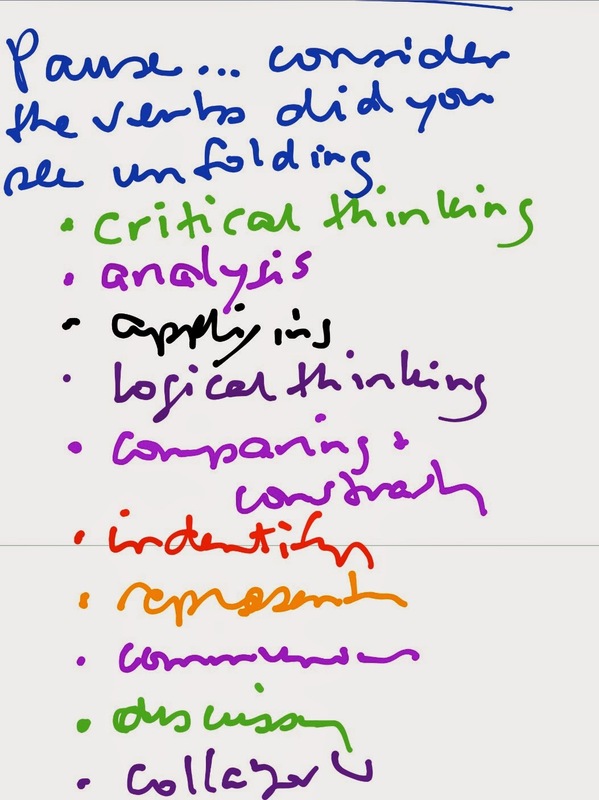 It is critically important that we not limit classroom assessment in these ways. What does work when it comes to classroom assessment? Teachers begin with the curriculum outcomes. They thoughtfully consider possible evidence of learning (products, observations of process, and conversations) of all the curricular outcomes. 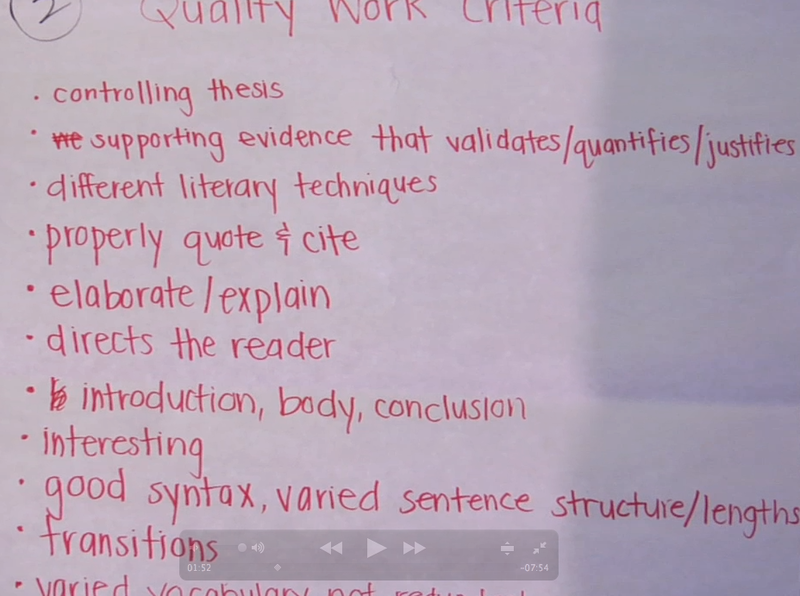 Teachers research quality so students and others have samples and models to illustrate the expectations for quality and proficiency. Teachers use the assessment information to inform their next teaching steps. Teachers deliberately help students use the assessment information to inform next learning steps. 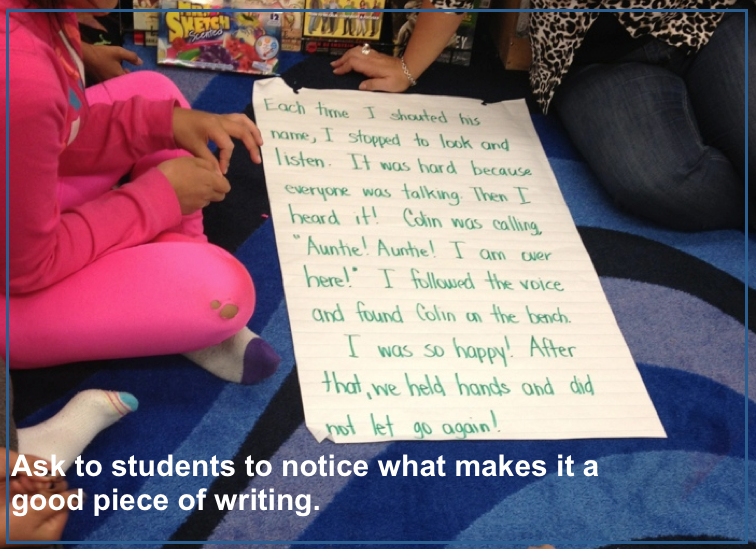 Teachers teach students to engage in formative assessment in support of their own learning. Teachers use the assessment information to inform their professional judgment and engage in summative assessment. This is the classroom assessment process. Classroom assessment is a research undertaking with clear procedures and articulated methods. It is the one upon which Making Classroom Assessment Work is based which is the reason a growing number of universities are using it as a course text in professional courses leading to teaching degrees. After all, classroom assessment is a research process. And, as Bennett's (2011) article reminds us, it doesn't come easily. It needs to be learned and carefully implemented. 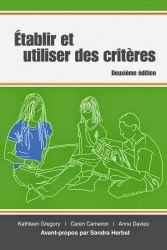 Assessment Reform Group (ARG). 2006. The role of teachers in the assessment of learning. Pamphlet produced by Assessment Systems for the Future project (ASF) http://arrts.gtcni.org.uk/gtcni/handle/2428/4617. Davies, A. Herbst, S. & Parrott-Reynolds, B. (2011). 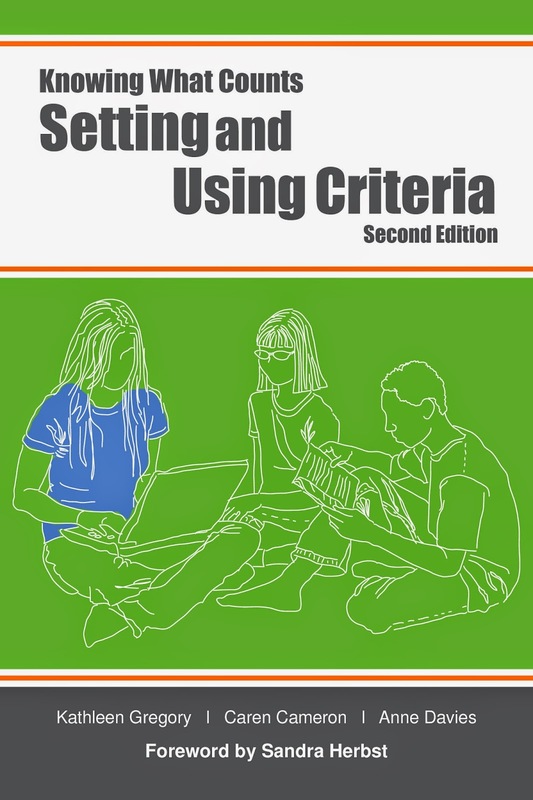 Leading the Way to Assessment for Learning: A Practical Guide 2nd Ed., Courtenay, BC: Connections Publishing and Bloomington, IN: Solution Tree Press. Lincoln, Y. and Guba, E. (1984). Naturalistic Inquiry. Beverly Hills, CA: Sage Publications.